ACES AND SAVVY - A WINNING COMBINATION! 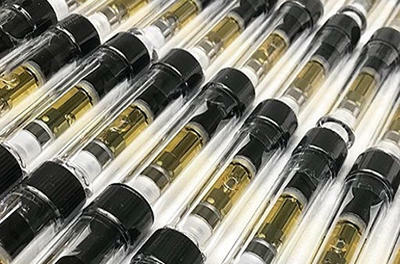 CB1 Brands launched its' new ACES Extracts cannabis brand in California with rave reviews. 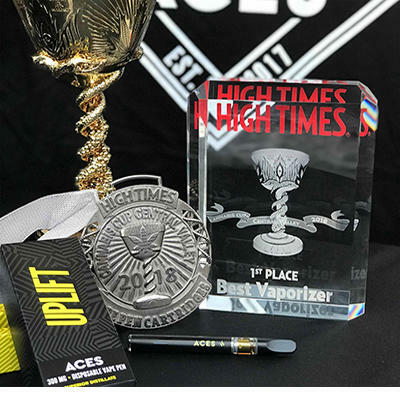 The top-shelf ACES Extract and C-Cell Disposable Vaporizer, sporting SAVVY made premium child resistant packaging, were awarded High Times 1st Place at 2018 Cannibis Cup. CB1 Brands "ACES Extracts" Award Winning DVP. Packaging (manufactured by SAVVY) rigid double slide sleeve box with acrylic CR enclosure. SAVVY was called upon by CB1 Brands to produce the “ACES Extracts” child resistant enclosure and premium packaging for their new disposable vaporizer. The criteria was clear - “make it awesome”, says the CB1 Brands marketing team. SAVVY welcomed the challenge. The challenge was that the package must meet Californias strict child resistant testing requirements without looking like the typical clunky unattractive design commonly used in the cannabis marketplace today. So, SAVVY conceptualized an inner child resistant enclosure similar to designs widely used in the pharmaceutical industry. SAVVY patent searched the design of the locking feature to verify it was in the public domain available for use. With the thumbs up from the CB1 Brands marketing team, SAVVY turned the concept into 3D, designed for manufacturing, prototyped and produced injection mold tooling. These clear acrylic enclosures really answered the call to be premium. During this time, SAVVY structurally designed - DFM ready, and prototyped the unique four part dual sleeve packaging. The rigid turned edge tray features an insert that proudly displays the disposable vaporizer in its clear acrylic enclosure. Then, nicely wrapped by a dual slide sleeve that pulls away in opposing directions. “Super cool!”, says the CB1 Brands marketing team. SAVVY managed mass production from first article, through quality control and delivery. As promised, SAVVY was able to meet the challenge and complete the project on time and on budget, a hallmark of their reputation. The dream team at CB1 Brands and SAVVY were successful in launching the ACES Extracts premium brand. Great reviews all around. With years of know-how and a network of global manufacturing partners, SAVVY is eager to make your project a reality with utmost efficiency. Prepared to anticipate your questions and move your project smoothly from your vision to finished product. Breathe easy as SAVVY handles the details, from concept to completion, so you don’t have to.